My favorite way to try new wines is to go to a wine bar. Generally these are boutique yet friendly establishments that have wines on pour-it-yourself systems (you buy a card and dispense your own samples), as well as a knowledgeable bartender and waiters and a decent-to-excellent wine list. I like to create my own flights—for example, I’ll ask for three different 2.5-ounce glasses of reds at the same time, to compare and contrast. I’ve found that a 2.5- or 3-ounce pour is more revealing than the splash that is a typical serving at a wine tasting. With a larger glass, one can experience more of what the wine has to say as it opens and changes. Recently I did just that at the Ormond Wine Company in Ormond Beach, Florida. I sampled a few lovely wines that night, but found a wine so beautiful I bought a bottle and took it home: the 2010 Klinker Brick Old Vine Zinfandel. This is the most delicious Zinfandel I’ve had in a long time, and it was so smooth that I was downright shocked to read the label later and find that its alcohol content weighs in at a whopping 15.8%. It doesn’t come across as hot at all. So be forewarned: this stuff is dangerously drinkable! Made from 85-year-old vines, it starts with the expected bright, singing, soaring aromas and flavors one expects from a good Zinfandel, with just a hint of cedar. It is obviously a Big Boy, with delicious black cherry and raspberry, but it’s amazingly smooth and soft with very little tannins. The wine isn’t sweet, but it doesn’t have the mouth-puckering dryness going on, either. Later it yields flavors of cola, caramel, and baking spices—each layer is just delicious, and the finish is long and satisfying. I paired it with a cup of delicious lobster bisque, and a roasted garlic bulb with roasted red pepper slices and a balsamic reduction. What a beautiful little meal. The 2010 vintage in Lodi was extraordinary with a long, cool growing season yielding beautiful, evenly ripened fruit. With aromas of black cherry, cedar shavings, vanilla and spice, this wine offers rich, supple flavors of cherries and plum, perfect balance and a long, smooth, lingering finish. Nutmeg, cardamom and pepper enhance an exotic nose but bright, dark fruits enhance a superb mouth filling experience. Our winemaker thinks this may be the vintage of the century! About “Old Vine”: The most rich, intense and multi-dimensional Zinfandel tends to be produced from “Old Vines,” vines that are at least 50 years old. “Old Vines,” also known as Ancient Vines, Gnarly Vines, Old Timer Vines, Old World Vines or Old Twisted Vines are in decline, mature in age, with low vigor. They tend to have fewer clusters of grapes with smaller berry size, yielding more intense sugars, color and concentration of flavors, producing wines that are generally better balanced with more body and structure. Don’t Forget the Soil and Climate: Soil and climate play an important role in the character and style of wines from Old Vine Vineyards. The longer, drier growing season in Lodi provides a distinct advantage over coastal areas. The grapes are able to “hang” longer on the vine, giving the pH and acid time to balance. This results in a wine with a longer, smoother finish. The deep, sandy loam soils enable the vines’ roots to grow deep and absorb moisture from below. Little water is needed, if at all, enhancing the color and flavor in the grapes. This entry was posted in California, Restaurants, Tastings, Tips, Zinfandel. Bookmark the permalink. 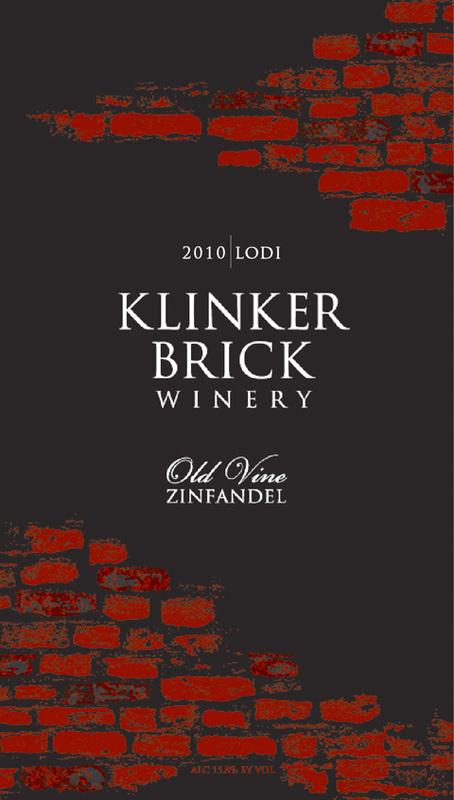 7 Responses to HIGHLY RECOMMENDED: Klinker Brick 2010 Old Vine Zinfandel, Lodi. 15.8%, $13.95 and up. I see more and more Zins labelled “old vine” In this blog we are given a definition: more than 50 years old. But who’s doing the counting and certification? Or is it just another marketing ploy to make potential buyers think the wine in the bottle is better than a “young vine” Zin lying on the next rack? But is this wine’s depth due primarily to the “old vine” characteristic or other things like the soil and the 2010 weather which are not on the label? Bob, these are great questions, and I will look into the answers. For now, I’m fairly sure one cannot say “old vine” unless they really are — label laws are quite strict and in fact each label must go through an ATF certification every year. Old Zin vines are gnarly with thick tree-like trunks, quite beautiful and haunting at the same time. However, their yield is less, and the flavors are more intense. So that, I think, is one reason why this Zin is so spectacular. Certainly the Lodi region (soil) has a little to do with it, although I have tried Zins from the area that are a lot more boring IMHO. And yes, the 2010 vintage with its long hang-time probably helped as well. Well, I was wrong. Such terms aren’t regulated at all, although winemakers seem to have settled on a consensus of 50+ being the line of demarcation for “old vines.” Regulations have been proposed a couple of times recently but nothing has been finalized. In my experience, winemakers are meticulous about their craft and what they say. I wouldn’t worry too much about whether someone is exaggerating or being deceptive when they produce a wine labeled “old vines” — and if you have a question you can look up the winery’s Web site. If they’re truly growing old vines, most likely pictures of same will be prominently featured. Nice review. I am a big fan of zin but I find some of them to be over oaked and that turns me off. Some of the Temecula wineries are making some really good old vine zin from what is left of the zinfandel vineyards in Cucamonga. A few are stunning. Thanks, Wine! Please feel free to make some recommendations. I’m all over “stunning,” especially if it’s affordable. The 09 Meiomi Pinot Noir was stunning (and the 2010 was just “eh”). I haven’t run across many fraudulent old vine claims, but I’m sure they exist. I have, otoh, run across plenty of old vine zin that wasn’t very good. I’d suffer with a decent zin where the age claim might be dubious rather than the Real McCoy that is a sink pourin’ wine. Agreed! I mean no one sets out to make bad wine, but when I read “Old Vine” on the label or in a description, I expect to find concentration and a patina of sorts. The Klinker Brick just SINGS and it’s fantastically smooth at the same time — definitely one of my favorites of the whole year.